Costco haul... some of my very favorite Costco items are in my stories on Instagram and here are two pics of my newest faves here. As you all know by now, most of my cart always contains produce, but here are a good handful of packaged items we love too. Happy shopping! 1. Autumn's Gold Grain Free Granola. Almonds, honey, pecans, sunflower seeds, coconut, vanilla, salt, and cinnamon. That's the ingredients list, folks. So yummy and I love topping my yogurt with this in the mornings or at night when I'm craving something sweet. 2. Chicken breast burrito bowl. I love these and they become the easiest pop-in-the-microwave meal. Have them as is, or pair them with a tortilla or over shredded lettuce... YUM. 3. Sweet mini peppers. As you know, there's a heck of a lot of produce I could've taken pictures of, but these mini peppers paired with the hummus on #4 is one of my favorite go-to snacks. 4. Kirkland hummus. Great ingredients and flavor. Perfect to pop in a lunch bag and to get your kiddos eating their veggies. 5. Jennie's coconut bites. You guys. I'm hooked to these. If you love Almond Joys, you're going to be in love. I put mine in the refrigerator and have one on the daily when I need a treat to top off my lunch. SO. GOOD. At least I think so. 6. Dave's Killer Bread. Always a staple. I always get extra to store in our freezer until we're ready to use it. It defrosts great. 7. Sweet Kale Salad Mix. This one is my absolute fave. I have it multiple times a week for lunch, either paired with something, or on it's own. I love throwing rotisserie chicken over top. 8. Columbus Turkey Breast: herb roasted, no antibiotics you need to worry about. Just yummy deli meat for sandwiches or wrapped around snap peas for a snack. 9. Kirkland Smoked Pulled Pork... holy mama this is good. It makes wayyy more than you'd realize and we always freeze extras to save for later. Tacos, burritos, over a salad or nachos. You name it, it's good. 10. Made Fresh Daily Sushi Rolls. Whenever I'm at Costco and starving, I love grabbing one of these to go. They're best eaten that day, but Bry and I love splitting one. 11. Aidells Chicken and Apple Sausage. Best flavor of chicken sausage out there. I have one of these links weekly, thrown into an omelette, or paired with toast and eggs. I seriously love these so much, and my whole family loves them too. 12. Teton Waters Ranch 100% Grass-Fed Beef. I get just a tad bit nervous around hot dogs haha. But these are ones I love and trust a little bit more than the ones at 7-11. Love these for the summer when we BBQ on the weekly. 13. Basil Pesto. This stuff rocks. I use some and then freeze the rest, either in ice cube trays or small tupperware. Great to have on hand for pasta and paninis. 14. Eggs. We go through so many eggs, this is the most inexpensive option for 24 eggs, and we love them. 15. Stir-Fry Vegetable Blend. Easiest to throw in a pan over the stovetop and saute in a little olive oil or sauce to put over rice, quinoa, noodles, or have by themselves as a side. 16. Wawona Frozen Festival Blend. Our favorite frozen fruit for smoothies and my kids love it too. 17. Nature's Path Pumpkin Seed + Flax Granola. Another amazing granola we all love. 18. Light and Fit Greek Yogurt. Although I'm not entirely in love with the ingredients list and prefer my homemade Greek yogurt over anything, this is a great go-to lower-calorie option when you're running around all day. 19. Boom Chick Pop. I love popcorn like this. It's a treat that isn't too heavy and I love it for movie night on the weekends. 20. Nature's Bakery Fig Bars: my kids love these and so do I. We always have some stashed in my purse in case we have toddler tantrums while we're out and about, and they always seem to do the trick. 21. L.R. Rice Raw and Unfiltered Local Hive Honey. For those with seasonal allergies, you need to try local honey. It helps me in the springtime and I just love Costco's options when it comes to spread and sauces like their Adams Raw Peanut Butter. 22. Terra Real Vegetable Chips - Sea Salt. Do I dare say these make my top five favorite chips list? They totally do. Love them so much. 23. RW Garcia Organic Sweet Potato Crackers. So yummy. 24. Milton's Gluten Free Crispy Sea Salt Baked Crackers. As you already have seen in the past, these paired with cottage cheese is pure heaven. Give it a try! 25. Seeds of Change Quinoa and Brown Rice. Always have these on hand. They take 90 SECONDS to prepare. It's unbeatable! 26. Coconut clusters... ohhhh boy maybe I shouldn't tell you about these. They're highly addictive. But absolutely worth it. 27. Vital Proteins Collagen Peptides. I have collagen with my smoothies. This supplement has no taste, but is great for your nails, hair, joints, and bones. 28. Organic PB Fit. A great option for smoothies to get that peanut buttery taste, without so much fat. 29. Coconut Almonds with Dark Chocolate. Not a healthy item here, but I can't just NOT list them!! They're so freaking amazing. Just be warned. 30. Fruit leathers. Ellie could eat 100 of these a day. And no, I don't let her. But I truly think this would be her #1 snack if she had to pick. And I love carrying them in my diaper bag to always have on hand while we're out and about. 31. Rice Rollers. Okay, I know most of you are probably haters, but I love these things. A light snack to have on hand and my kids love them too. Double bonus. Okay, before I get into the 40's I think I'm going to stop for now. But I'll continue to add things to my highlights bubble so you can refer to them. WHAT AM I MISSING!? What do I need to try at Costco to add to this list!? A quick leg circuit to throw into your routine. My @momstrongmove peeps... be looking for something similar in part of your workout next week #hinthint. Grab a heavy resistance band and get to work! Heyoooo my #lightitupchallenge group, you may be seeing part of this number in your next week's lower body workout... just sayin.' It's SO GOOD. If you haven't joined my Light It Up Challenge, JOIN NOW! We start next week and you have to sign up by this Saturday for the discounted price. New workouts for you each week, a flexible meal plan, + daily motivation through the month of December. At just $1/day for a total of $25. It's a no-brainer! Hit the link in my profile on Instagram (@momstrongutah) to sign up! Give this one a try. Add it to the end of your workout like I did today and you'll be burning! 1. 10-12 reps, Banded squat knee pull-outs (I was holding a 20# KB here)2. 10-12 reps, Banded single leg front lunge pulses, separate reps EACH SIDE3. 10-12 reps, Banded squat jumps4. 40-50 reps, Banded high knees, keep that quick pace!Repeat through 3-4x. Have an amazing Wednesday! A pre-feast turkey day total body challenge! Get it in! Grateful for a body that allows me to move and breathe. End with 20 Banded squat knee abductions and 20 banded plank jacks into leg lifts into 1 minute of banded high knees. Repeat 2-3x if you want, or leave it at that for a quick burn! Happy Thanksgiving! THE SPOOKY STEP WORKOUT. All you need is a step! Happy Halloween! A cartwheel if you're feeling like today's going to be another amazing day! Legs are fired up and feeling good. Try this one out! First time through, 12 reps. Second time through, 10 reps. Third time through, up to 12 reps again. Go, girl. 1. Close to reverse lunges, each leg… (close to reverse = ONE rep) ...fight through the burn! A glutes/leg/hamstrings workout for you today! Give it a try!! You can do it without a resistance band as well. 1. Slow squat into 10 pulses. Lower slowly, and then pulse 10x before coming back up. Do this 5 times through... and yes, it will burn. Phew! Repeat entire circuit 2-3x through and then stretch those wobbly legs out! Bry's 30th birthday was in August, and if you know me, you know I LOVE surprising him… especially for his birthday. I knew I really wanted to make this year extra special. When we first got married we decided that traveling with just the two of us was something that was always worth saving our extra pennies for. A few months back, I snagged some killer deals on flights to San Fran and a hotel without Bry knowing. Since he's never been there and it's one of my favorite cities in the U.S., I decided I would gladly be his tour guide. ;) So I did my research, looked up the food spots I wanted to try, and we had the best and most romantic 3 1/2 days to ourselves without kids. I'm a big believer in continually doing the things that fuel your marriage... date nights, overnighters, vacations, etc. and this was yet another memorable experience for both of us. 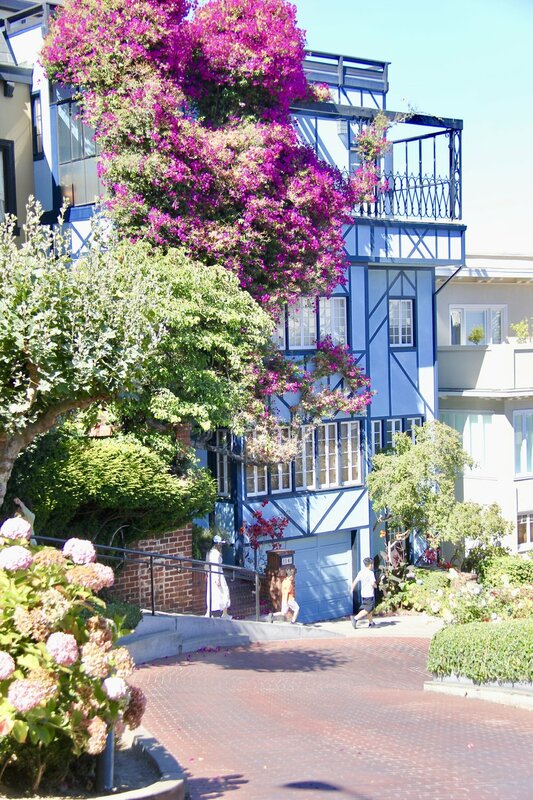 If you haven't been to San Fran yet, it's a must-visit city in the U.S. This is our itinerary, and I'll give my tips and things I would've changed along the way to make your trip absolutely flawless. Out of everything… Bry and I would both agree the FOOD and seeing the city by BIKE were our favorite things. San Fran boasts some of the greatest food in the world, and since both of us are foodies, this was such a highlight. We ate and biked our way through the city, and I hope you enjoy! Make sure to click on “settings” and watch in 720p60 HD! Fly into SFO and catch an Uber or Lyft ride to your hotel. We stayed at Warwick Hotel and LOVED this place- you can't beat the location (right next to Union Square, our favorite Mexican dinner spot Colibri, and San Francisco Rental Bikes around the corner), and it gets bonus points for being so dang cute. Whatever hotel you decide on, get there to unpack, settle in, and then get ready to be a tourist for the day. Here are some things we did the first day that I’d recommend, if you’ve never been to SF before. They’re touristy, but for good reason. Take the trolley down to Fisherman’s Wharf. Either you can pay for the old cable car down there ($7/one way/person, and be ready to wait in line), or take an older trolley from Market Street for $2.50/person. Be ready to have cash to pay. **Word on the street though, is that if you download the “Muni” App, you can ride the cable cars and all other public transportation for only $12 a day and kids under 5 are FREE! Totally worth it! That way you can take the cable cars or trolley or bus and access it all day long.) Fisherman’s Wharf spans several blocks, and Pier 39 is probably the most visited. 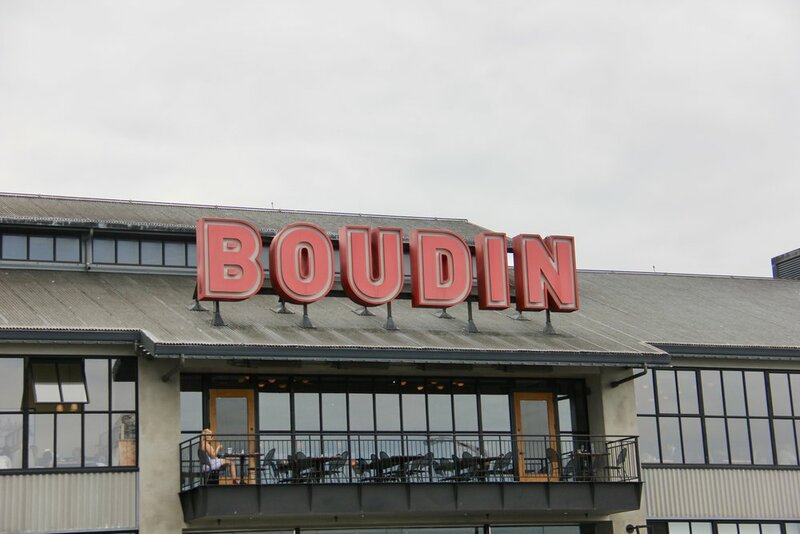 Make your first stop for food at Boudin Bakery in Fisherman’s Wharf. Clam chowder in a bread bowl or the grilled brie with fig and apple. YUM. I personally don’t love the tourist shops around that area, but it’s fun to walk the boardwalk, and you may have to stop at Lola Toy Shop when you see it. It has some cute trinkets and things to take home. Make sure to watch the seals at Pier 39 too- they make me laugh so hard. Bike Golden Gate Bridge. This is a must! We always love to see cities by bike, and this is a fun and scenic ride. We walked through Fisherman’s Wharf, picked up a donut at Krispy Kreme on the way to the bike shop, and picked up our bikes at San Fransisco Bike Rentals. *Tip: go online beforehand to make your bike reservations. You’ll save around 20% this way! We did a full day of bikes and figured we could cover more ground, avoid the trolley and bus fees, and that the price was worth it to us. If you wanted to opt out of the full day reservation and pay hourly, that’s an option too! I do have to say, we loved the bikes so much, we ended up reserving them for two more days… way too much fun! You can bike Golden Gate Bridge to Saulsalito and then take the ferry back. If you do this, make sure to take pictures at Vista Point in Saulsalito. We decided to ride the bikes there and back since we were looking to ride a little further. It was so foggy on one side of the bridge, and complete sunshine on the other. Make sure to get a pic with the bridge in the background and plan on anywhere from 2-4 hours to complete this whole route depending on what stops you take along the way and how fast you bike. TOTALLY WORTH IT! Next up, Ghirardelli Square. For a bite of chocolate, obviously, but also just to see this fun little square. If you go inside the chocolate shop, make sure to ask for a sample square of their chocolate- you can taste test the ones you want to. My favorite: the dark chocolate sea salt caramel. I also love their regular milk chocolate fudge and chocolate dipped Oreos. There’s this shop in the square called Gigi + Rose (children). This children’s store was the CUTEST ever. 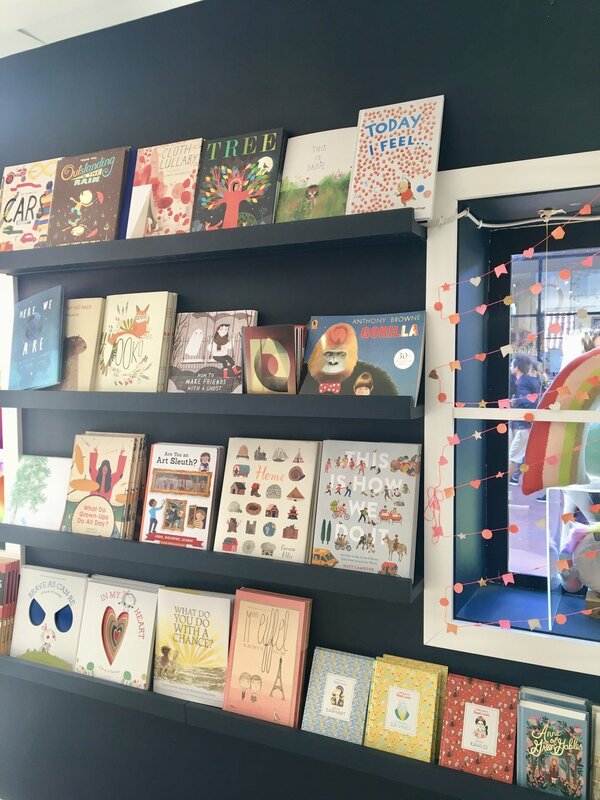 I wanted everything in it, but decided to screenshot all the picture books and other things to see if I could find them online for a cheaper price haha. We were so hungry, and didn’t want to go looking too far for dinner, and so we ended up taking our bikes back, walking the wharf, watching street performers, and eating at Bubba Gump Shrimp Co. back at Pier 39 before taking the trolley home. The best part of dinner was for sure the ocean view! 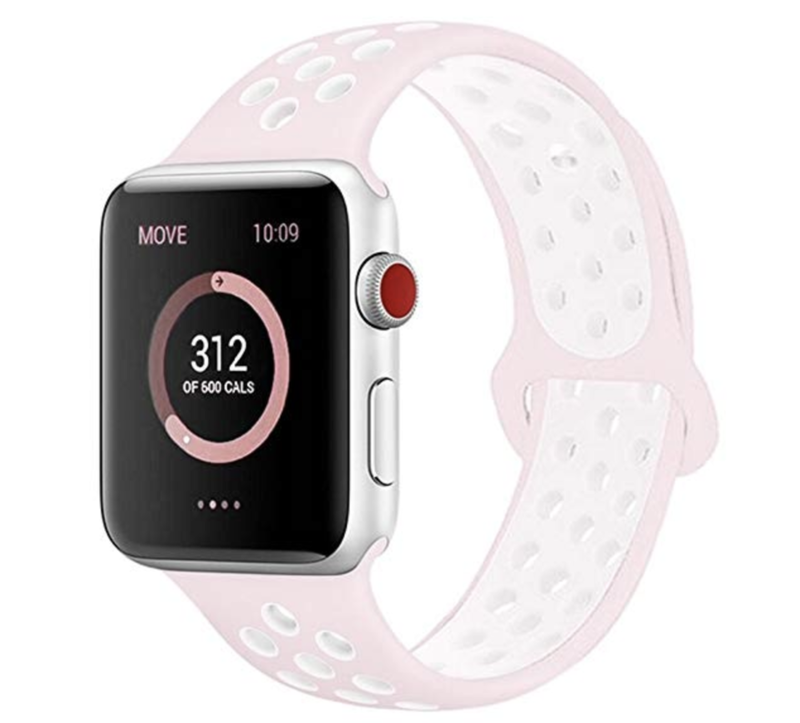 I personally love getting in exercise as I travel, and so we got up early-ish and walked up the street to 24-hour Fitness. Did you know they have “Bring-a-friend-for-free Friday?” If you’re ever traveling, and there’s one in your area, you can go workout on Friday for FREE. I also like looking up to see if there’s anything else fun around: Orange Theory Fitness, Soul Cycle, or any other gyms, etc. After our workout, we walked back to our hotel and hit up Farm Table on Post Street for our post workout breakfast. This is the cutest little place. The kitchen is TINY but you’ll see people there and out on the sidewalk every day. The workers are super personable and I love that this food is all FRESH and using the best ingredients. Follow them on Instagram at @farmtable to see what their special is. I got the House Cereal and Bry settled for the Savory Tart. And their fresh-squeezed juice!? Yum. 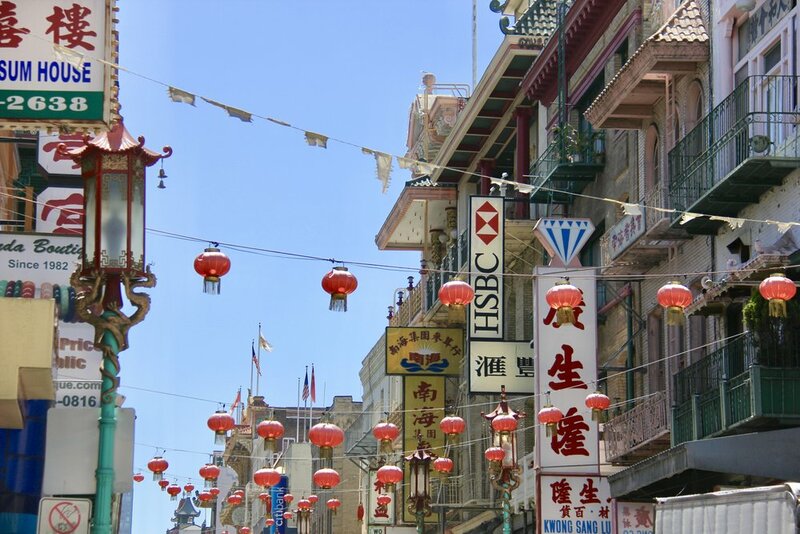 Little Italy: If you walk through Chinatown, you’ll eventually get to Little Italy. And once you’re here, there are two places to try. They are both a MUST. First, Tony’s Pizza. And second, Mama’s. Okay let me explain. Tony’s pizza is DIVINE- some of the most authentic Italian pizza in San Fran… think thin crust, fresh ingredients, straight out of the oven… You can either sit down in the restaurant, or go next door to the Slice Shop where they serve single slices to-go. We opted for that since we knew we’d be waiting in line for Mama’s. We called it our “appetizer” for brunch haha. You could even take a couple slices to go and eat at Washington Square across the street and take a gander at Saints Peter and Paul church just down the street. Mama’s is some of the best brunch we have EVER had. I can’t even believe how good it was and already dying to go back to try more things off their menu. If you go in the morning, you can wait in line for up to 3 hours. The trick is to go right before they close at 3. We made it there by 2 and waited for ~30 minutes before getting our food. I even saw some people almost walk in without a wait around 2:30. Either be there bright and early or late in the afternoon to avoid the lines. I ordered the Eggs Benedict special (you can’t go wrong with the Eggs Benedict!) and Bry ordered the Swedish Cinnamon French Toast. I’ve heard incredible things about everything there. We ended up shopping in Union Square that night. 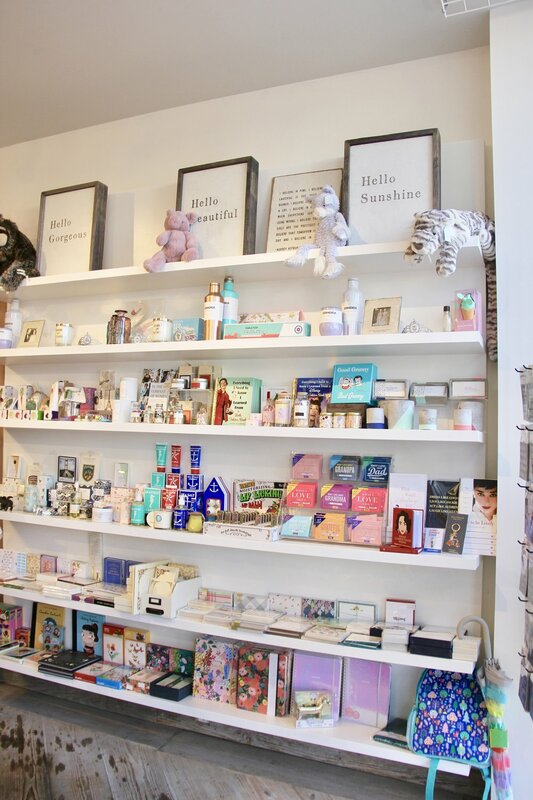 There are SO many fun shops to visit… from Anthro, to Nordstrom, to a HUGE Nordstrom Rack, to Crate and Barrel, to Madewell, to Uniqlo (which has the my favorite PJs ever and fave undershirts known to man)… they have it all! Make sure to take a peek into Britex fabrics… one of the largest fabric stores. So incredible. We shopped for a bit and were so hungry that we were looking for anything on our way back to our hotel that looked decent. We came across this place a few doors down from our hotel, and it ended up being the BEST surprise… we ate there two nights in a row! The place is called Colibri. Best. Mexican. Food. Ever. Okay here’s what you need to order when you go. It was about 9 pm when we finally sat down to eat, and by the time Bry finished his last bite he said, “Meg, I’ve just had a spiritual experience.” We were laughing so hard because we realized we hardly had said a word to each other the entire time. We were just scarfing everything down… Literally heaven. You need to order the Tacos de Pescado (fish tacos). I know it’s listed as an appetizer, but trust me… just order it for your entree and get the fresh guac for your appetizer instead. And then came the best part. Drumrolllll……….. the dessert: Churros Rellenos: churros filled with caramel cream served with dulce de leche ice cream on the side. Do I need to say more? I’m not even kidding you, I have craved these every week since. We took the churros “to go” for two nights in a row and ate them in our PJs in bed, and I pretty much died and went to heaven. SO FREAKING GOOD. Please go and order that exact same thing if you visit. You’ll love it. As you can tell by now, we didn’t waste any time. Day three was another jam-packed, but adventurous day. One of my very FAVORITE things we did in this entire city, was visit the Farmer’s Market at the wharf on Saturday. It’s held outside and inside the Ferry Building. YOU HAVE TO GO. We ate some of the best food, tasted the most delicious produce, and spent a solid couple hours walking around all the booths. It was the most incredible experience. We rented bikes again in the morning, rode down there, parked them while we walked through everything, and then hopped on them again afterward. When you go to the Farmer’s Market, don’t look any further for your breakfast. Stop at The Farmer’s Wife for their breakfast sandwich (Bry’s favorite thing in the universe), or at Roli Roti to get the Porchetta sandwich. 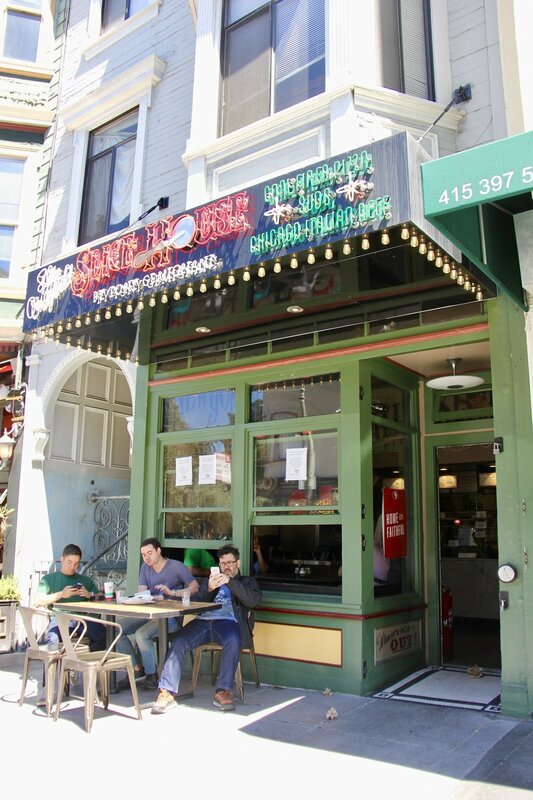 You’ll see a line at Roli Roti, but it moves fast. Those two things are a MUST. The other place to visit if you’re there around lunchtime is Primavera. The best Mexican stand with shrimp and snapper tostadas to die for. 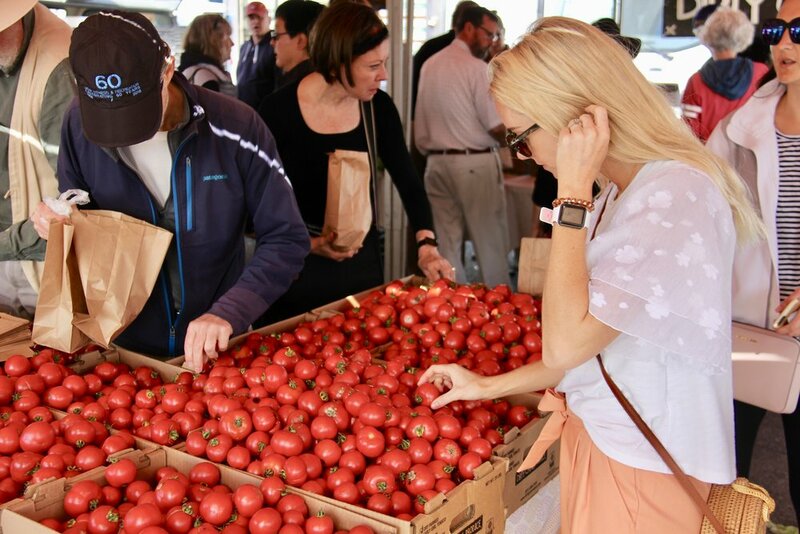 Other things we loved at the Farmer’s Market: Dirty Girl Produce has the best tomatoes. I could’ve eaten a basket by myself! Make sure to find the “Pasture” stand and taste all their different flavors of olive oil and balsamic vinegar. The pomegranate balsamic vinegar with bread? OMG. If you see “Frog Hollow Farm,” snag a bag of their dried fruit: either the apricots or the cherries to take on the go. And then a secret hidden gem: inside the Ferry building, there’s a woman at a table selling her homemade hot cocoa with cream. Your belly might already feel like it’s going to explode haha, but get a cup to share! SO good. And she’s the sweetest thing. After the Farmer’s Market, we hopped back on our bikes and rode the wharf again and watched more street performers. I love San Fran’s big bike lanes. Bry and I had never been to an MLB game before, and so we bought tickets online. We rode our bikes to the AT&T park to watch the SF Giants play the NY Mets. And you bet we went all out… matching hats, salted pretzels, and cheering our guts out. So much fun. I wouldn’t suggest seeing these next things in this order, and especially on bike (unless you want a long full day of riding and a LOT OF HILLS like we did). If you have another full day, I’d suggest doing these next things and covering more area the next day. But, if you’re cramming it in like us, these are some fun things to add to your list. After the game, we rode all the way to Golden Gate Park, and mostly because we wanted to find the Twirl and Dip Ice Cream truck: Dark Chocolate Dipped Vanilla Bean and Sea Salt ice cream cone!? UMMMM YES. #worthit. The truck is right in the middle of the park, and it was such a beautiful spot in San Fran. Even though we biked up so many hills to get there, it was also fun seeing a new part of the city I had never seen. On our way back to our hotel, we stopped at Painted Ladies, the famous houses against an amazing backdrop of the city. And then a little bit of shopping with … yes… you guessed it… Colibri for dinner again and their churros to-go. Guys, sometimes I’m a little embarrassed about how much we ate every day while we were there… but then I think, why the heck would I be!? The food was our favorite part of the entire trip and we lived it up. No regrets. YOLO. We didn’t need to be at the airport until 4:30 pm and so we were able to sleep in (until 9:30! That neverrrr happens haha), grab bikes again and ride to church, stop for the best brunch of our lives at MyMy Cafe in Nob Hill (order the Baja California Eggs Benedict and French Toast or Souffle Pancakes and your life will be changed forever), and pack up to take an Uber ride back to the airport. San Fran, you treated us well. My friend Emi has the best food suggestions after living there, and this list helped me to plan a ton. Thank you, Emi! 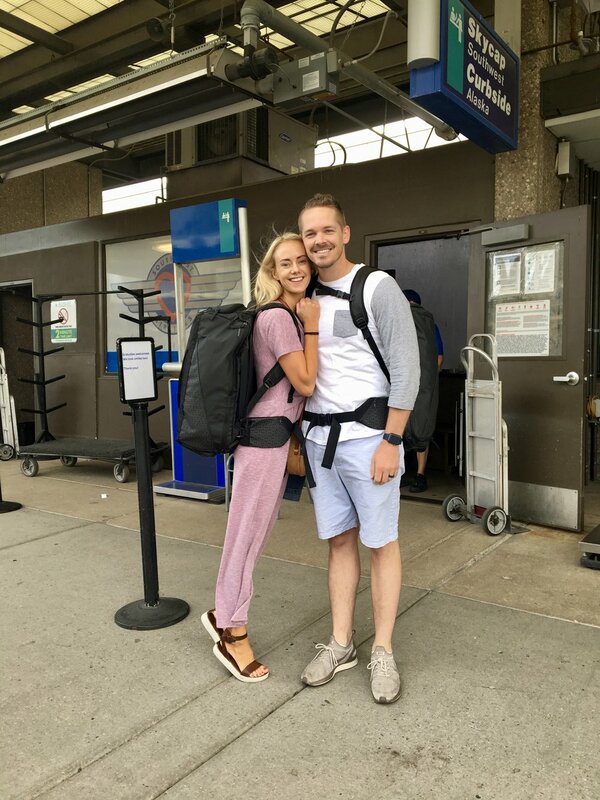 Also, these bags are our favorite travel bags ever, and I have a special 20% discount with the code “momstrong20” until November 27th. USE IT! 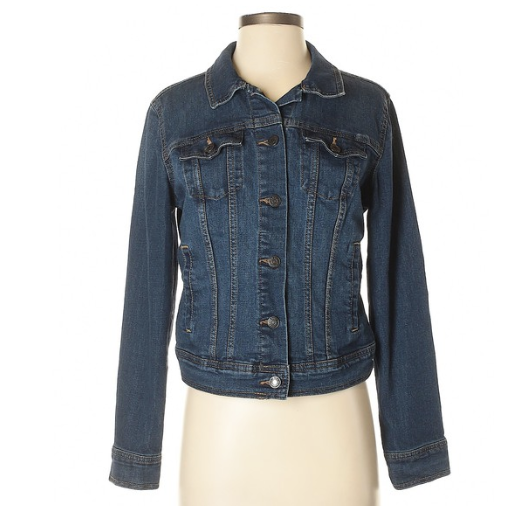 Also, scroll down to the bottom to shop my style. I hope you loved this travel guide and let me know if you have questions! Twin Peaks: an amazing view of San Fran if you have time to go! Sourdough class at La Victoria Bakery in The Mission (taught by Sour Flour) - I’ve heard great things! If you have any more suggestions of places to see or places to eat, I’ll add them to this list! Click the images above to shop my travel clothes/items. The sandals are only $24!!! Also, I linked my favorite undershirt EVER and also my favorite PJs. 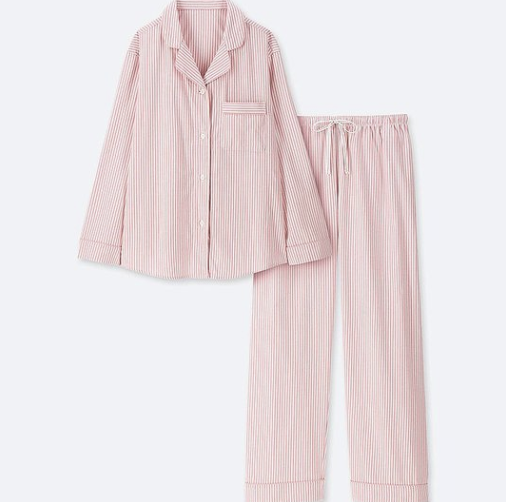 (Christmas is coming up, and these are super affordable PJs!) Also remember to use “momstrong20” for 20% off your Nomatic travel bags/accessories. A Tabata for you to try today! Never tried one of these? They're my jam when I don't have a lot of time. Add this to the end of your workout today. It's only FOUR MINUTES long and you can repeat it through for 8 minutes if you'd like. Everyone has four minutes. So add this into your day sometime today. Either in your workout, at the end as your finisher, or even just by itself! Get after it! Here are the rules of a Tabata: For this one, there are only four moves. For each move you are working AS HARD AS YOU CAN for 20 seconds, with a 10 second rest in between. Repeat each move each twice through for a total of FOUR minutes. Ready, go! 1. Sprinters high knees. Get those knees upppp! Repeat and after it's all done, your timer should read four minutes. Nice work, ladies! Today's your day! Time to get moving! I have a core workout ready for you, and it's HOT! You can do this two different ways! 30 seconds each move for 3-5x through. OR… Four rounds: 20 reps/15 reps/10 reps/5 reps of each move. Your choice! Good luck! Let me know how you like it! You know those kinds of meals you could have over and over and over? Well, this is one of those. So easy, healthy, delicious, and something the entire family will love. Get one large sweet potato for each person you are feeding. This will give you extras for lunch the next day. Peel and cut into long matchsticks. Toss in avocado oil and put on a tin-foil-lined baking sheet. Bake at 425 for 12-15 minutes. Flip and then bake another 12-15 minutes or until starting to brown and crisp. As those bake, cook your ground beef and season with taco seasoning and set aside. Once your fries are done, spread onto plate. Top with ground beef, tomatoes, avocado, green onions, and a sauce of plain Greek yogurt (or sour cream)/lime/salsa mixed. Enjoy warm! Such a good circuit to get that heart rate up high and those muscles put to work. DO IT!